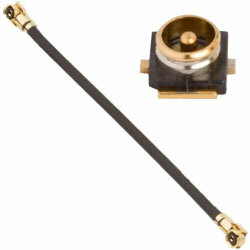 Amphenol RF has introduced the small form factor AMC4 connector series. This micro-miniature product series provides a popular push-on coupling design and is fitting for IoT applications which need space efficient, economical designs. The connector provides outstanding electrical performance from DC to 6GHz and operates at 50Ohms. This precision stamped and formed connector is intended to mate with the previously released AMC4 jumper and is interchangeable with both the I-PEX MHF4 and Murata HSC connectors. The connector is currently the tiniest connector in the company’s portfolio. It shares a comparable footprint with the previously released AMMC connector and provides all the same benefits as the AMC interface but in a more compact package size.